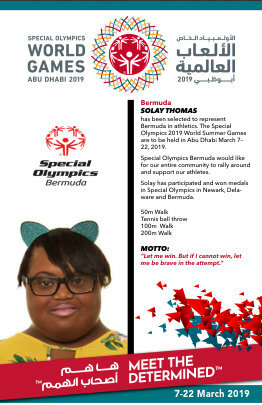 Today we bring you Solay Thomas who has been selected to represent Bermuda in Athletics. Thomas has participated and won Medals in Special Olympics in Newark, Delaware and Bermuda. Thomas has competed in the 50m walk, 100m Walk, 200m walk and Tennis Ball Throw.